Is everyone loving the chalkboard trend? 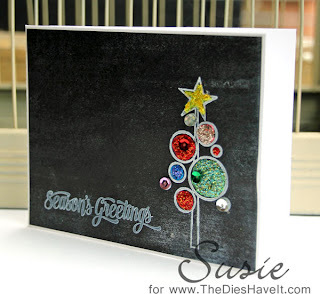 Hero Arts has a stamp that will replicate a chalked background. I used their Unicorn Ink here on some black card stock. I just love the look! The tree stamp is called Shari's Tree #2 and is also from Hero Arts. I used Stickles and sequins to decorate my fun tree. My local scrapbook store, The Crafty Scrapper carries all of the products I used today. If you aren't local, check on line at a Simon Says Stamp. Really Cute. I have been tempted by that hero arts stamp set. It really looks great. Such a cute card! I have Hero Arts Shari #3 tree and I love it! Really cute card! Loving the chalkboard look! Love that tree on the "chalkboard" -- looks great! Love the tree. Very unique. I just got the stamp so you really got me thinking!